CRAIG Hird said he had one thing in mind when he bought his rural property near Mount Larcom and it definitely wasn't a steel mill. Mr Hird and his wife Debbie live in a house on a hilltop with a stunning view of the back of Mount Larcom peak. Their 13.5ha (33-acre) property has a handful of animals on it and is a tranquil place. Now it seems their view is about to change dramatically. Boulder Steel plans to build the Gladstone Steel Plant Project on a flat clearing beneath Mount Larcom peak. 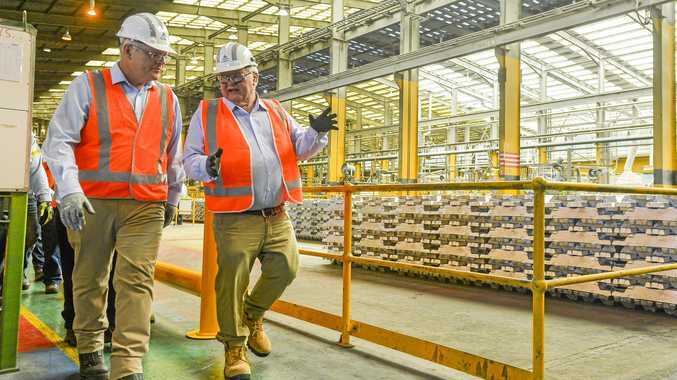 It is on the Gladstone State Development Area, which was established in 1993 to set up industrial projects such as Rio Tinto's alumina refinery and Cement Australia. Mr Hird is not thrilled about his new neighbour. "I don't want to live with it," he said. "I don't mind them building it as long as they buy (my) property." Mr Hird said he was not against progress. But he believes the steel mill will ruin the view from his home, and defeat the purpose of living there and reduce the financial value of his property. He said Boulder Steel should buy him out, since its project would de-value his property. "Walk up here now and you would love to buy this place," he said. "Walk up here in two years time and there'll be a steel plant there." The argument might seem simple, but the background is complicated. When Mr Hird bought the property seven years ago, the State Development Area had already been created. According to a government representative there was never any doubt the land could be developed for industrial use. Mr Hird said that although he knew he was buying property with a view of the State Development Area, he was under the impression the relevant land was a buffer zone which would not be built on. The government representative confirmed there were buffer zones. But those zones had not been breached by the Boulder Steel project. "The Gladstone State Development Area was declared in 1993 and the first development scheme in 2000 included the land subject to the proposed (steel plant project) as being suitable for industrial development," the representative said. Boulder Steel said it could not comment on Mr Hird's claims. The Gladstone Steel Plant project site is about 600ha and about 25km north-west of Gladstone's CBD. Do you think people who buy near industrial areas have the right to object to development? Yes. Sometimes development goes beyond what was expected. No. They should've known what they were getting into.